We’d love your help. Let us know what’s wrong with this preview of The Five Manners of Death by Darden North. Dr. Diana Bratton is a surgeon surrounded by bodies after the discovery of her Aunt Phoebe’s 50-year-old note detailing the manners of death. Suicide, accident, natu After a construction worker unearths a human skull on the campus of the University of Mississippi dating to the 1960s, an older woman’s desperate attempt to erase history counts down the five manners of death. Dr. Diana Bratton is a surgeon surrounded by bodies after the discovery of her Aunt Phoebe’s 50-year-old note detailing the manners of death. Suicide, accident, natural cause, and one death classified undetermined are soon crossed off this list—leaving Diana to believe that only murder remains. When Diana spots photographs in a 1966 university yearbook, Phoebe is linked not only to that death, but to the recent deaths of two local men. Diana is torn between pursuing Phoebe’s innocence and accepting police theory that her aunt is involved in the murder of several men she knew in college. To ask other readers questions about The Five Manners of Death, please sign up. My favorite book so far Darden North! Started one Friday and finished by Saturday Night. Loved the suspense it has, couldn't wait to turn the page. Loved how it kept me guessing and loved being from Jackson, the plots that took me here and all over Mississippi! This was awesome, can't wait till next one! As a surgeon, Dr. Diana Bratton often sees dead bodies. But when they start showing up in her personal life, she begins to get spooked. The victims are not especially close to Diana, but somehow she feels as though they are linked to her. She talks to her friend Key Martin, who happens to be the Chief of Police in their town. Diana helped him solve crimes before when he was a detective and she hopes to get his thoughts about the recent deaths she either witnessed or heard about after she crossed paths with the deceased. Martin is more than willing to get any extra information from her, and will share a bit of his findings with her. As the story progresses, they find more pieces of the puzzle due to their collaboration. Unfortunately, the clues are leading them closer to people she cares about or cared about at one time. Diana is determined to get to the bottom of the situation before it comes home to roost. After all, she has a teenage daughter to worry about as well as her Aunt Phoebe, the only two people she loves and cares about. There is a doctor that she fancies, but her involvement with the police does not sit well with him. While the plot I just described may sound like a cozy mystery, rest assured The 5 Manners of Death is not. This fast paced crime novel alternates between 1965 and present day. The events that occurred in 1965 come crashing to a halt on the doorstep of a present day murderer who will do anything to remain unidentified. North expertly crafts the characters and settings to pull the reader into the story and holds you until the last pages bring the novel to a spectacular end. It is no surprise that Darden North is an award winning author. He paints landscapes and parlors with his words, filling every scene with lifelike characters that could be the people next door. Of course you might not want some of them as neighbors. This is the first book by North that I have read, but I am looking forward to reading his previous books, House Call, Points of Origin, Fresh Frozen and Wiggle Room. 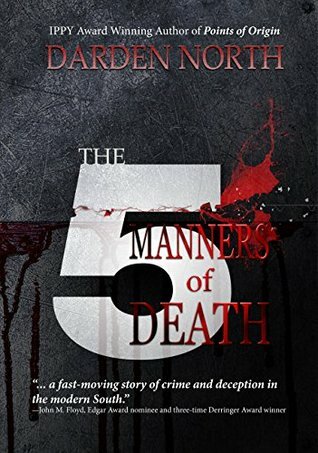 I highly recommend The 5 Manners of Death to anyone that enjoys a great mystery with complex characters. Plenty of twists and turns to keep you on the edge of your seat in this contemporary whodunit, set in the modern South. Dr. North's best book yet, IMHO!!! I did run across a few "errors"... Near the end, as the ambulance was pulling away, the blue of the lights pulsed across the trees. In MS(in fact, I believe in all of the US of A), emergency medical vehicles run red strobe lights. A couple minor grammar glitches... Most glaring was the reference to padding the city of Oxford's "coiffures"(we know those Ole Miss co-eds love their tresses), but should have been "coffers". All of which I'm willing to accept, because, Dr. North's best book yet, IMHO!!! The 5 Manners of Death is a book that really pulls you in on the first page. I love how you follow the Aunt's essay through the story along with the main character. And the ending is a total surprise which at first, you feel cheated. And right at the very last, you end with a very satisfying conclusion that makes you want to immediately reread to see if you can pick up any clues as to the villain's true intentions. Very well written. It appears that someone in Jackson, Mississippi, is following suit with each of the manners of death. As each person dies, Dr. Diana Bratton finds herself, as well as her aunt Phoebe, more and more involved. The tangle of lies begins to unravel after a body buried 50 years earlier is discovered on the Ole Miss college campus during a construction project. According to Aunt Phoebe, she never knew the deceased. Diana learns of the deception after seeing a 1966 yearbook from Ole Miss in her aunt's belongings. Aunt Phoebe not only knew dead Rusty Reynolds well but she also knew several of the newly deceased. So, what could possibly be the connection between 50-year-old skeletal remains and more recent deaths among the same a circle of friends from that era in college? I've read everything written and published by Author Darden North and have to say that with each novel he gets better and better. "The 5 Manners of Death" has to be his best yet and I hope will become a long time series. Every time I thought I had come up with a connection between the Ole Miss students from 50 years earlier and the contemporary deaths, I found myself to be wrong. I incorrectly pegged the whole motive and killer all the way to the very last pages. The cover drew me to this book. I immediatley wanted to pick up, start reading, and NOT put it down until finished. Dr. Diana Braton lives with her daughter, but her medical practice pulls time away from her family life. Her ex-husband [who has remarried] lives nearby but Diana doesn't trust him. Suddenly people around her begin to die and her Aunt Phoebe might be connected to their deaths. Diana does not want to believe that Phoebe is involved. On top of the current murders, a skeleton is uncovere I received this book for free. I am voluntarily leaving this review and all opinions expressed herein are my own. Brad, the boyfriend of this fine novel’s heroine Diana, says at one key juncture: “Closure. 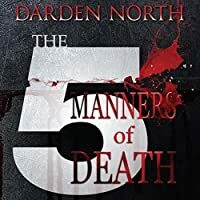 That sounds like dialogue from a Lifetime movie.” Given its skill, style, and cleverness, The 5 Manners of Death by Darden North is the furthest thing from a Lifetime movie. The 5 Manners of Death is a terrific mystery, and boy, do the revelations keep coming right up to the very last page. North writes with such a keen eye and with such lucidity that the reader is rewarded with great pleasure as the lurid secrets unfold. I have read all of Darden North's books and found that his work continues to improve, even as the reader thinks the last one was already perfection . The Five Manners of Death is an intense, fast moving mystery that kept me turning pages in an effort to keep up with the pace of the story. Well done! I can hardly wait for the next one! I loved the setting and most of the mystery, but had some issues with the ending and the writing itself. A full review will be available on Reader Views soon. Decent enough pacing and premise. Just OK.
Darden North's mystery and thriller novels have been awarded nationally, most notably an IPPY in Southern Fiction for "Points of Origin." "The Five Manners of Death" released June 15, 2017, joins his other novels "Wiggle Room," "Fresh Frozen," and "House Call." Darden has served on author panels at writing conferences including Killer Nashville, Murder on the Menu, SIBA Thriller Author Panel, and Darden North's mystery and thriller novels have been awarded nationally, most notably an IPPY in Southern Fiction for "Points of Origin." "The Five Manners of Death" released June 15, 2017, joins his other novels "Wiggle Room," "Fresh Frozen," and "House Call." Darden has served on author panels at writing conferences including Killer Nashville, Murder on the Menu, SIBA Thriller Author Panel, and Murder in the Magic City. To book Darden for a book club, book signing, or presentation contact: Darden@DardenNorth.com. A board-certified obstetrician-gynecologist practicing at Jackson (MS) Healthcare for Women, Darden North is Chairman of the Board of the Mississippi Public Broadcasting Foundation and member of the Editorial Board of the Journal of the Mississippi Medical Association. He lives in Jackson, Mississippi, with his wife Sally and enjoys family, travel, and, outdoor activities. The Norths have two adult children, who also work in the medical field.